Encouraging my peers and bringing awareness to beautiful, inspiring and relevant stories in my community are two tasks I am able to accomplish with this post. Barbara Florvil is a force to be reckoned with, with a kind heart, powerful mind, and an impactful word to match. It’s an honor to share her captivating story of her ”Becoming”. For as long as I’ve known Barbara, I’ve always complemented her on her big, brown, beautiful eyes. They radiate in the sunlight and gleam in the dark; they’re so lovely! They’ve seen many things and with serving missions twice in Ghana and once in Haiti, they tell stories of wisdom far beyond her years when you look into them. The love of God has been planted in Barbara’s heart and mind by her passionate Haitian parents. They have done an outstanding job raising Barbara and her brothers to love God and to love knowledge. Barbara’s scholarship and artistry is motivated by her faith, and inevitably “The Becoming” found her while she was earning her Masters of Divinity at Princeton Theological Seminary. This is just my theory, but I think those who knew Barbara beforehand had always seen “The Becoming” within Barbara. Barbara has been performing powerful spoken word pieces since I’ve met her with many times moving her audience to tears. Whether it was a poem or a sermon, all ears who could hear knew “The Becoming” was brewing. “The Becoming” was a warm and graceful delivery of the Gospel through art, music, and poetry. 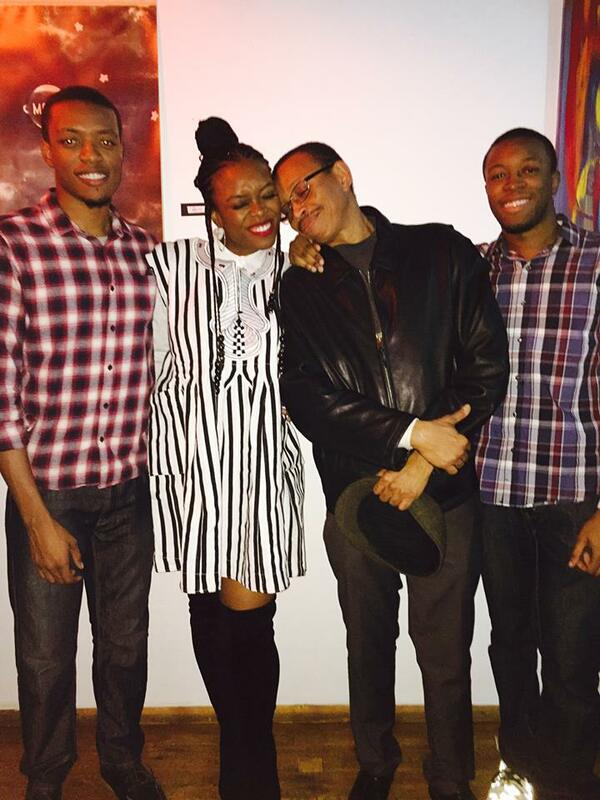 The poetry showcase hosted in Brooklyn, New York was the result of an Independent Study class called “Poetry as Proclamation” at Princeton Seminary. Today, I offer a special ‘thank you’ to Dr. Gerald Lui. He might’ve been the professor who placed Barbara on assignment, but I think it was in fact God who placed Dr. Lui on assignment. I imagine that while advising Barbara, Dr. Lui looked into her brown eyes and saw “The Becoming” in her too. He saw Barbara’s desire to bind art and ministry together pulling at her heart. He also saw how the Move of God would perform in a unique way outside of church walls using Barbara as the force. It was time for “The Becoming”; Both God and Dr. Lui believed she could do it. So she did. I admire Barbara for using everyone and everything within arm’s reach to bring “The Becoming” to life. She proved that everything you’ll ever need to accomplish a goal is already in your hand. Like the story of Moses with his wooden staff, she used what was in her hand to part the seas of fear and doubt and allow her dreams to pass through. Being a Brooklyn native, Barbara was used to walking past the hustle man, the icee lady, bodegas and store fronts in her ‘hood. She had always walked past the Stratosphere Lounge located at 227 Utica Avenue. The Stratosphere opened its doors over 50 years ago originally as a travel agency but has now become a creative space for the Crown Heights community. Once Barbara had been placed on assignment, the normal store front she always walked by became a potential venue, so she decided to peek her head in the window. Ethan, the owner spotted those big brown eyes and invited her to take a look at the place. The rest is now herstory. Fast forward to December 1, the Stratosphere set the atmosphere for “The Becoming.” With LaThelma Yenn-Batah on the vocals, Samuel Yenn-Batah on the drums (and sax) and Duke Anderson on the keys, these soulful creatives also known as the “The Souljourn” serenaded us with an original theme song for the event and “it” began. I can’t really describe what “it” is. I knew I’d cry that night simply because I am moved by beautiful experiences, but what I didn’t know was I’d transcend into my own becoming. One of the most beautiful things about art is that there’s always room for everyone. We were carried into musical intermission by William D. Carter III and rapper I-Glow and even before Barbara blessed the microphone, striking paintings by Haitian-American artists Carmelle Beaugelin and Pierre Jean-Baptiste adorned the walls of the Stratosphere. Pierre’s 3 piece display titled “The Vagabonds” depicted the abstract contorted ways society views African-American people, but with bold use of primary color juxtaposition, Pierre also showed the beauty of our people no matter what society may tell us or others. Carmelle’s gorgeous painting was dedicated to the majestic mountains of her homeland Haiti, intentionally featured to complement the Haiti inspired piece that was soon to be delivered by our Poet of the evening. Also hanging on the walls was artwork by Gary Lindgren. While everyone else saw Gary as the friendly maintenance employee at Princeton, Barbara’s eyes saw the Artist and asked him to donate a painting to make the evening complete. “One thing about music, when it hits you, you feel no pain.” These are words by the timeless Bob Marley, and after leaving the Becoming, I’ve learned that poetry holds the same power. If poetry were music, Barbara was the conductor and we – the audience were her orchestra. Barbara stood tall in a black and white Yelkeboro original batakari, spoke to the crowd through bold Fenty Beauty red lips, and whisked her baton of words. We followed in unison with chords of “hmmms”. When she paused for a half-step and lifted her head adorned with cornrows and beads, we paused with her. Barbara’s poems covered a variety of topics ranging from God, racism, Haiti, self-love and family. Her words connected our hearts to hers, and we were able to witness “The Becoming” pour out from her soul. A personal favorite was a love letter to her future life partner titled "Hey" which began with “First of all, we are both whole.” Other poems like “Rise” spoke to the little black girl who needed to be reminded to take up space in a world that tells her to shrink. There was a piece that spoke of the Jesus who died on that mountain in Golgatha because of His love for us all. Another piece simply titled “As”, was dedicated to the loving memory of the late Soeurette Florvil which opened and closed with the same-titled classic by Stevie Wonder. I tried not to make eye contact with the other teary eyed guests to keep from crying harder. I wonder what it must feel like to stand in front of a room and have everyone cling to your every word. Despite the assumed pressure Barbara Florvil handled it with style and grace. These streets are still buzzing about the way Love made the earth shake that night in Brooklyn. Barbara called out “The Becoming” of greatness within all of us that night. Those with dreams and visions were called to action. Those still seeking their journeys were comforted in knowing there’s a divine glory destined for us all. I am thankful that I was a witness, and I’m thankful for Barbara’s obedience to follow her heart and passion. The greatest lesson of all? “The Becoming” is only The Beginning. I know that this isnt the last time we'll see Barbara bless an audience with her spoken word. To stay updated with her upcoming appearances, follow her on Instagram here.